After seeing weeks of propaganda pushed on the populace insisting that the Supreme Court’s ruling on homosexual marriage is something moral and steeped in our nation’s tradition of liberty, I’m upset. After reading about the shootings in Chattanooga, enabled by a spineless national security apparatus and laws intended for the disarmament of the citizenry, I’m angry. After watching our President and his clown of a Secretary of State sell so cheaply the security and strategic balance of an entire region of the world, I’m mad. After seeing the video of that doctor from Planned Parenthood talking about the precious lives of aborted babies as nothing more than tissue to be sold for the continuation of that organization’s horrendous acts of murder, I’m livid. And so I simply had to study what the Bible says about this emotion of anger. How can it be used righteously, and when does it become an impediment to my service of the High King? Let’s dissect the account a bit in order to understand how anger can be righteous and how it can be righteously applied. Even though all four gospels tell about the Temple cleansing (instructive in itself), I’m using Mark’s account because he is the only one who records that Jesus entered the Temple on Palm Sunday and then walked out again. I’ve heard ministers and read writers who believe that this was because Jesus wanted more people around for His cleansing – almost some sort of political calculation about maximum impact; and I wouldn’t doubt if that is partially true. I’m certain that Jesus wanted His words of denunciation to ring as widely as possible. Purity of worship can never be overstressed. But the other reason I’ve heard for His walking out on Sunday seems more likely to me; and certainly more important for the purpose of this post: I believe that He wanted to take a moment to think about the appropriate action, to allow the anger to subside (if possible) or build (if necessary) and to apply some time and distance to the equation. I think that we must do the same … sometimes and maybe most of the time. But other times (admittedly it’s hard to know when) we must denounce the evil we see around us immediately to abstain from any appearance of condoning it. My suggestion for how to learn when to do either the former or the latter is the only thing which we can do: learn what is right by regularly reading and meditating on the Bible, so that you can identify the evil by juxtaposition. Think about it: an expert counterfeiter’s product can only be identified as a counterfeit by another expert. How can an art expert tell whether a Rembrandt is real unless he studies real Rembrandts? How can a Secret Service Agent tell whether a $100 bill is real unless he studies real $100 bills? How can a Christian know what is wrong without studying what is right? Neither John the Baptist nor Jesus were willing to hold back their tongues, nor their power (of persuasion, instruction, or otherwise) in their identification of good and bad fruit. Which makes me think that it was rather instructive, and rather ironic, that as Jesus is walking toward Jerusalem – purpose evident in every step, righteous anger building a reserve of energy in his body – that He looks up into the branches of a tree – a tree which was descended from one fashioned by the Son of God’s own words thousands of year before – and now that very Son of God finds the tree bereft of the fruit which is it’s very purpose. Jesus’ curse was apt in its timing as the tree paralleled the misuse of the Temple, and His curse is both alarming and sobering as it reveals God’s true feelings about squandered opportunity and perverted religious authority (reference His Parable of the Talents for more on this thought: Mt 25 and Lk 19). And the story continues eloquently and succinctly on these two thoughts. When Jesus yells out, “Is it not written: ‘My house will be called a house of prayer for all the nations’? But you have made it a ‘den of robbers,’” He was not just using some phrases form obscure portions of Hebrew scripture! He was challenging them with the most relevant words of God given through His prophets and He was calling down judgment upon a nation which had squandered its birthright. The quotation of “My house will be called …” comes from Isaiah 56:7 and, in context, it is the Lord speaking of His desire for foreigners to “choose what pleases [the Lord] and to hold fast to [His] covenant” (v. 4), and in return God promises that “[He] will give them an everlasting name that will endure forever” and that “[He] will bring [them] to [His] holy mountain and give them joy in [His] house of prayer” (vv. 6f). God even promises in verse 7 that, “their burnt offerings and sacrifices will be accepted on [His] altar.” Therefore, when Jesus yells at them, “My house will be called a house of prayer for all the nations” He’s pointing out their repulsive extortion of the pilgrims who are trying to worship God. Jesus was accusing the moneychangers of a shakedown of their fellow Jews, He was accusing the sellers of doves of corrupting the reason for sacrifice, and He was accusing those who enabled the entire apparatus (i.e. the Sanhedrin) of abhorrent swindling. The second part of Jesus’ cry in the temple courts (“but you have made it ‘a den of robbers’”) comes from Jeremiah 7. God tells Jeremiah in 7:1 to go to the Temple Gate and proclaim His words. The words themselves are an indictment of both the religious authorities of Jeremiah’s day and of Jesus’ day as the Son of Man echoes Jeremiah with authority. Finally, think about how violent the actions of Jesus in the Temple Courts were. We sometimes are taught to think of Jesus purely in terms of meekness – as if we take the “as a sheep before its shearers is silent, so He did not open His mouth” (Is. 53:7) description as indicative of Him being like some weak, beta male, wimp. However, considering how much pain and suffering He experienced in His life on earth – not just on the cross, but also by losing loved ones, by working hard physically His entire life, by caring for his family after Joseph died, etc. 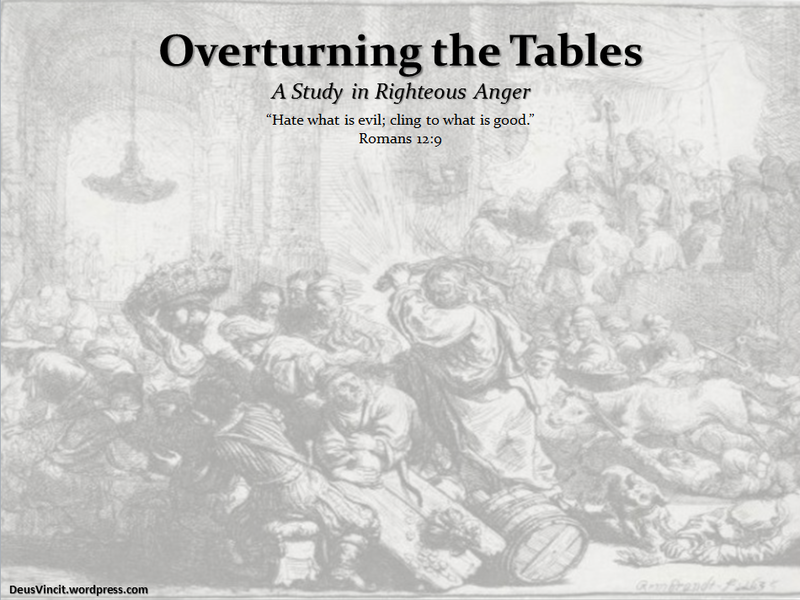 – it seems almost inconceivable that the image of Jesus tearing through the Temple Courts, overturning tables, and whipping the profane cheaters would be a surprise to us. Jesus was no weakling, only interacting with the world through vapid, bumper sticker statements of hollow encouragement. Neither was Jesus a robot, unable to feel emotion and only responding to outside stimuli as programmed. Instead He was powerful, courageous and brave enough to speak truth to power over and over again. He was not just the Lamb of God, He was the Lion of Judah; and His mighty roar of indignation upon those who used His Name in vain echoed down through the ages and reverberated in the courts of the Temple so that none could misinterpret its powerful meaning: God’s wrath and judgment are poured out on the unjust and the ungodly. And that’s where those of us now living in the twenty-first century come in. It is clear from the story of Jesus’ actions in the temple, as well as all of the interlocking pieces (the exit to, and return from, Bethany; the fig tree; and the prophesies of Isaiah and Jeremiah) of that story that there is a clear place for anger and a clear place for the condemnation of evil. Even more than that, there is a place for us to act on that anger as well. Make no mistake, anger having a use does not give license to take revenge (Rom 12:19), nor to rise to insults (Prov 12:16), nor to stew in your grudges (Eph 4:26, Jas 1:19f). But it also means that it can be a tool for righteousness and an expression of empathy for the plight of the victims of injustice and circumstance. When applied correctly, it is a way to say to the unbeliever, “You’re exactly right! This world IS INDEED unjust and unfair, and we should do all that we can to change it for the better.” I think that many of the unbelievers of this world look at God’s church and view its lack of action as a lack of courage mixed with indifference and hypocrisy. In other words, we do more harm than good by holding our tongues in the face of evil! Paul wrote in Romans 12:9, “Love must be sincere. Hate what is evil; cling to what is good.” So … sincere love hates evil and clings to good? That’s interesting. In other words, you can’t sincerely love others (or “be devoted” to them, as Paul says in v.10) without being fully empathetic with them in their situation. By “rejoic[ing] with those who rejoice; [and] mourn[ing] with those who mourn” (v.15) we empathize and love most poignantly in a mutual bearing of their plight. And, very often that plight is caused by things outside of that person’s control; which means that the sincerely loving action and response is to recognize and hate the evil that caused it. It seems sometimes that we as Christians have subscribed to a spiritless philosophy of resignation overall and have subsequently missed out on the opportunities the Spirit affords us to let our lights shine before men (Mt 5:16). We may correctly believe that God holds all things in His hands (Prov 30:4) and that “all things God works for the good of those who love Him” (Rom 8:28). However we inexplicably extend this thought to a philosophy which removes responsive action. We aren’t passive passengers looking around at our surroundings like sweaty tourists at Disneyland on “Its A Small World”; we’re called to make a difference … and to make a difference we have to make a stand! “Hate what is evil; cling to what is good” means clarify to the world around you the detestable effects of a life lived in sin so that you can then declare the praises of Him who called you out of darkness into His wonderful light” (1 Pet 2:9)! That proclamation cannot be weak or tame or safe because God Himself isn’t weak or tame or safe. Yes, He sometimes reveals Himself in the still, small voice, but just as often He shows Himself in the lightning streaking across the sky, the thunder rolling through the hills, the earthquake splitting the ground and the mighty wind ripping across the plains. And while I agree that the majority of the time our most effective tool in bringing individuals to Christ is through mercy, grace and love (there’s so little of it out there), when evil rears its ugly head and plunges mankind into ever-deeper canyons of desecration, we do our God a disservice not to cry out in anger! That’s why you and I are justified in our anger over a human body redefining an institution built by God. That’s why you and I are justified in our frustration over continual destruction of individual liberty. That’s why you and I are justified in our irritation over the destabilization of regions we have sacrificed our blood and treasure in attempts to civilize. That’s why you and I are justified in our fury over people who treat precious human life as mere tissue! In fact, if you aren’t angry over what sin has done in this world, then you aren’t paying attention and repentance is in order! Furthermore, if you subscribe to a resolute attitude of non-judgment in an effort to “be loving”, then you don’t understand what love is. Love is a decision, not a feeling or an aloof, impersonal apathy. It’s a decision to NOT be satisfied with watching as the precious souls around you plunge headlong toward hell. Love fiercely defends, it bravely stands, it courageously speaks with clarity and truth … and to do all of that correctly sometimes requires righteous anger that overturns the tables of culture. Rise up against the rage of my enemies. Awake, my God; decree justice. Let the assembled peoples gather around You, while you sit enthroned over them on high. Let the Lord judge the peoples. Vindicate me, Lord, according to my righteousness, according to my integrity, O Most High. Bring to an end the violence of the wicked and make the righteous secure – You, the righteous God who probes minds and hearts.